(Nanowerk News) Scientists have long worked to understand how crystals grow into complex shapes. Crystals are important in materials from skeletons and shells to soils and semiconductor materials, but much is unknown about how they form. Now, an international group of researchers has shown how nature uses a variety of pathways to grow crystals that go beyond the classical, one-atom-at-a-time route. The findings, published today in Science ("Crystallization by particle attachment in synthetic, biogenic, and geologic environments"), have implications for decades-old questions in science and technology such as how animals and plants grow minerals into shapes that have no relation to their original crystal symmetry. Or why some contaminants are so difficult to remove from stream sediments and groundwater. "Researchers across all disciplines have made observations of skeletons and laboratory-grown crystals that cannot be explained by traditional theories," said Patricia Dove, a University Distinguished Professor at Virginia Tech and the C.P. Miles Professor of Science in the College of Science. "We show how these crystals can be built up into complex structures by attaching particles — as nanocrystals, clusters, or droplets — that become organized into complex shapes. Many scientists have contributed to identifying these particles and pathways to becoming a crystal — our challenge was to put together a framework to understand them." The results emerged from discussions among 15 scientists working in the fields of geochemistry, physics, biology, and the earth and materials sciences, including at the Department of Energy's Pacific Northwest National Laboratory. At home, these researchers conduct lab experiments, investigate animal skeletons, study soils and streams, or use computer simulations to visualize how particles can form and attach. Crystals grow in multiple ways, from the classic addition of one-by-one addition (bottom-most) to whole crystal subunits. The international group met for a three-day workshop in Berkeley, California, that was sponsored by the Council on Geosciences of the Office of Basic Energy Sciences of the Department of Energy. "Because crystallization is a ubiquitous phenomenon across a wide range of scientific disciplines, a shift in the picture of how this process occurs has far-reaching consequences," said materials scientist and physicist James De Yoreo at PNNL. "Moreover, because we largely show a community consensus on this topic, the study has the potential to define the directions of future research on crystallization." In animal and laboratory systems alike, the process begins by forming the particles. 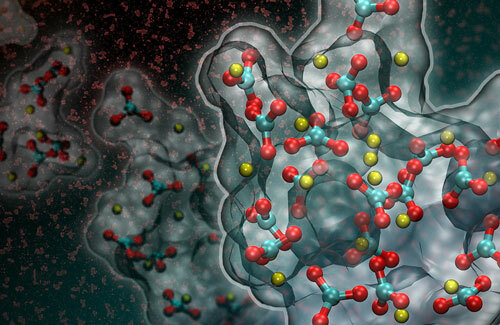 They can be small molecules, clusters, droplets, or nanocrystals. All of these particles are unstable and begin to combine with each other and with nearby crystals and other surfaces. 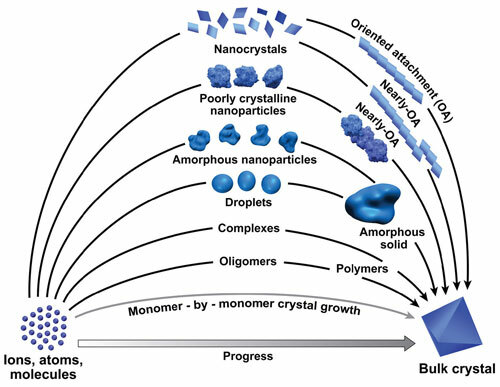 For example, nanocrystals prefer to become oriented along the same direction as the larger crystal before attaching, much like adding Legos. In contrast, amorphous conglomerates can simply aggregate. These atoms later become organized by "doing the wave" through the mass to rearrange into a single crystal, researchers said. 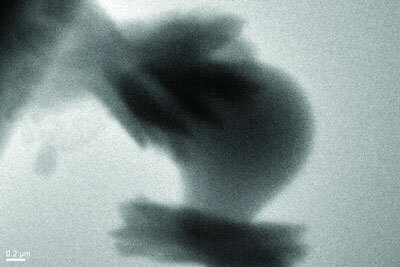 Study authors say much work needs to be done to understand the forces that cause these particles to move and combine. It is one of the frontiers for new research. These crystals of aragonite, with the characteristic "sheaf of wheat" form, grew on the surface of a particle of amorphous calcium carbonate. "Particle pathways are tricky because they can form what appear to be crystals with the traditional faceted surfaces or they can have completely unexpected shapes and chemical compositions," said Dove, the corresponding author of the study and a member of the National Academy of Sciences. "Our group synthesized the evidence to show these pathways to growing a crystal become possible because of interplays between of thermodynamic and kinetic factors." By understanding how animals form crystals into the working structures known as shells, teeth, and bones, scientists will have a bigger toolbox for interpreting the crystals formed in nature. The insights may also help in the design of novel materials and explain unusual mineral patterns in rocks. Likewise, knowing how pollutants are transported or trapped in the minerals of sediments has implications for environmental management of water and soil. "How we think about the ways to crystallization impacts how we interpret natural crystallization processes in geochemical and biological environments, as well as how we design and control synthetic crystal growth processes," said De Yoreo. "I was surprised at how widespread a phenomenon particle-mediated crystallization is and how easily one can create a unified picture that captures its many styles."